Quinoa is a good choice on a low FODMAPs diet as it’s a good source of fibre and is higher in protein than other grains such as rice or corn (though it’s technically a pseudo-grain). 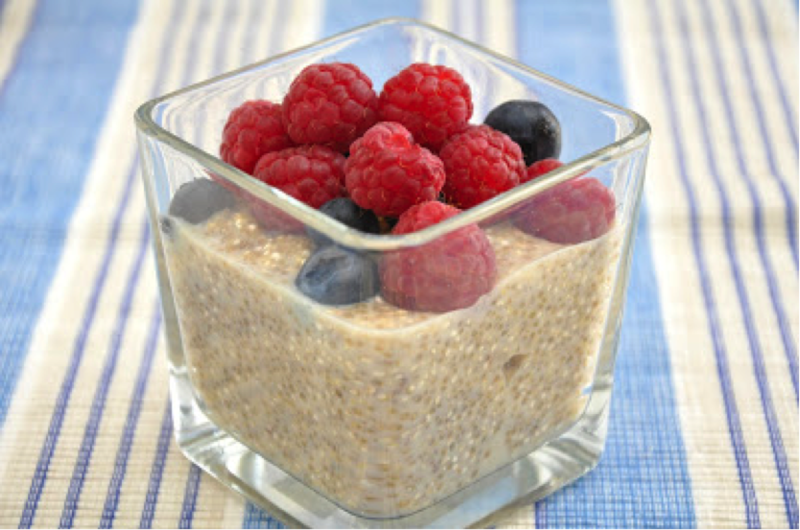 Quinoa flakes are made in a similar way to rolled oats – the grain is steamed and then rolled to create thin flakes. They can be used to make a hot porridge, but they have quite a strong flavour when heated that some people don’t like. When served cold and soaked in milk and a little sweetener, the quinoa has a subtle flavour that pairs well with fresh fruit. This pudding is a quick, easy and nutritious breakfast for people who don’t have much time for meal preparation in the morning – simply place it in the fridge the night before and it’s ready to serve for breakfast. It’s also a good option for people who prefer to eat their breakfast on their commute or once they arrive at work – just mix everything together in a reusable container instead of a bowl. LSA is a mix of ground linseed (also known as flaxseed), sunflower seeds and almonds which thickens the pudding, so don’t leave it out! LSA also provides additional dietary fibre, unsaturated fats and vitamin E.